Shipping By FedEx - Usual purchase order and shipping time = 6 to 7 business days. We're confident that our "High Gloss Clear Vinyl Laminated Graphics" are superior products over our competitors. Using non laminated graphics or any liquid laminated graphics (a water based material) are less durable with less surface gloss and can not compare to our race proven "vinyl laminated" material. We use the same quality materials on our Motorcycle Graphics as our Race Cars and Race Bikes. Our graphics slap concrete walls at oval tracks nationwide, while retaining quality and beauty. Our Material Adhesion Factor = Drag Cars doing speeds in excess of 260 MPH within 24 hour of application. Material Thickness = 3 mil. thick using 3M and Avery-Dennison vinyl materials. 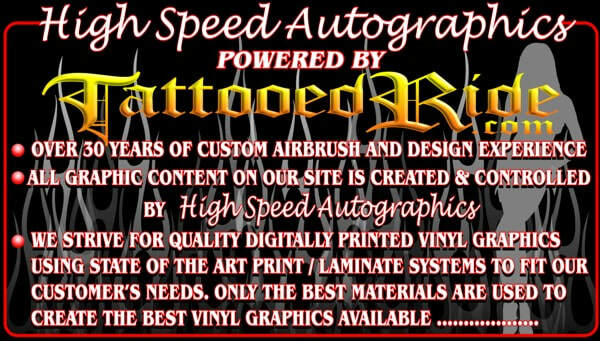 All content on this site is created and controlled by High Speed Autographics.